June is World Refugee Awareness Month and June 20 is World Refugee Day, an internationally-observed date dedicated to highlighting the plight of more than 22 million global refugees. According to the United Nations High Commissioner for Refugees, the number of refugees is at its highest level since 1995 while the total number of people forcibly displaced from their homes is only second to what it was during World War II. Countries marred by war, famine, and sectarian violence face onerous challenges in limiting the growth of their own refugee crises. Properly and effectively dealing with refugees needs to thus become an endeavor that the whole world must rally around. The stakes are high—in order to save millions of people from living in uncertainty, the needs of refugees must be addressed in the long-term. 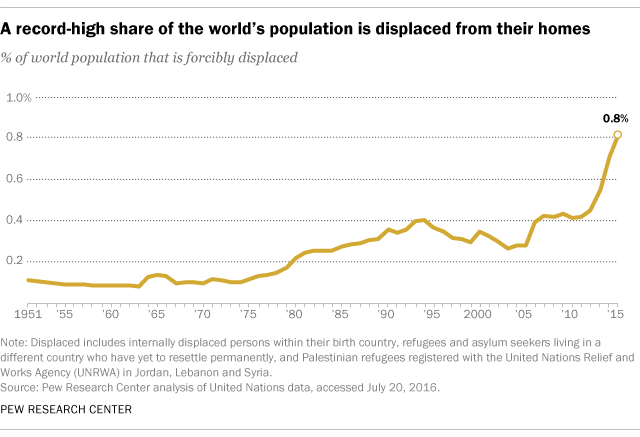 Nearly 1 in 100 people worldwide are now displaced from their homes. Where do most refugees come from? 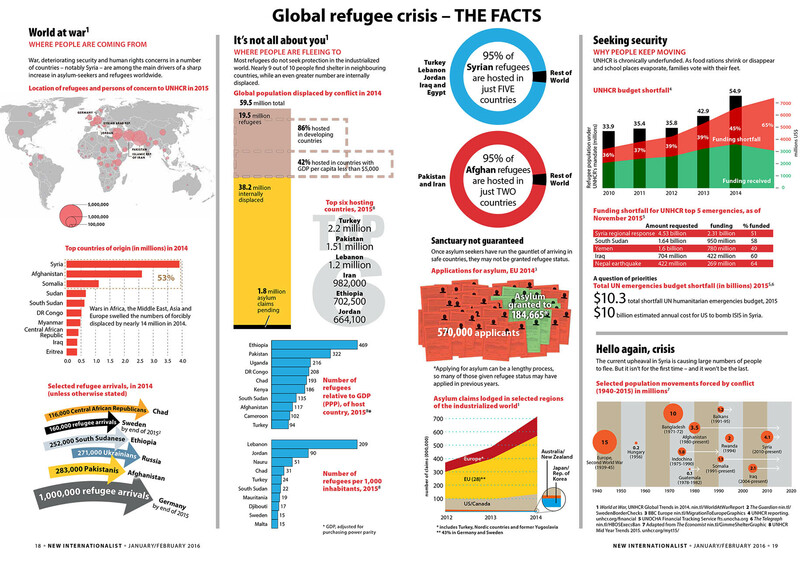 The majority of refugees originate from Syria, Afghanistan, South Sudan and Somalia (due in part to the wars there), but other conflicts in Africa, the Middle East, Asia, and Europe contribute to a sizable proportion of the total refugee population as well. Where do most refugees claim asylum? Contrary to popular expectations, nine out of ten refugees do not seek protection in the industrialized world. Most find asylum in neighboring countries (95% of Syrian refugees, for instance, are hosted by Turkey, Lebanon, Jordan, Iraq, and Egypt). Over 30,000 people per day are forced to flee their homes because of conflict and persecution. About six-in-ten Syrians are now displaced from their home, an unprecedented number for any single country in recent memory. The largest refugee camps in the world include Kakuma Camp in Kenya (> 180,000 people), Zaatari in Jordan (> 70,000 people) and Yida in South Sudan (> 70,000). About three million refugees have been resettled in the U.S. since Congress passed the Refugee Act of 1980, which created the Federal Refugee Resettlement Program and the current national standard for the screening and admission of refugees into the country. Nearly 39,000 Muslim refugees entered the U.S. in fiscal 2016, the highest number on record, according to a Pew Research Center analysis of data from the State Department’s Refugee Processing Center. Something unusual is about to take place at this year’s White House Correspondents’ Dinner (WHCD) that hasn’t happened in 36 years: the President isn’t coming. SAD! President Donald Trump decided to skip town because, well to put it mildly, he doesn’t like the media. Instead, President Trump is slated to “hold a BIG rally in Pennsylvania” on Saturday, April 29, the 100th day of his presidency. Served as U.S. Secretary of State (1996-2001), first woman to ever hold position. Albright also took part in the first ever U.S.-China High-Level Political Party Leaders Dialogue, organized by the EastWest Institute in 2010. The historic Women's March took place on Saturday, January 21, 2017 in cities across the globe. Centered in Washington, D.C., where over one million people attended, the event drew over five million more protesters around the world, according to organizers. Julia Malleck, an intern with the EastWest Institute, attended the rally in New York City and shared some pictures for EWI Nextgen. Click here for Julia's analysis of the event in New York City.